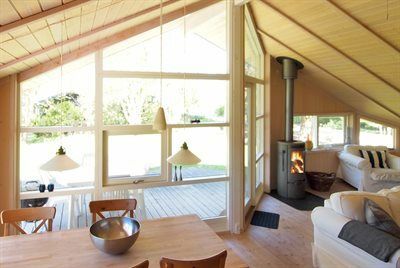 A lovely 102 m2 summer cottage from 2006 in Klint, which is a region in the beautiful Odsherred. A large 1390 m2 natural garden with lots of space for ourdoor activities. 450 metres to the sea. Nearest shopping possibility lies in a distance of 950 metres from the house. Holiday home suitable for 8 persons . The holiday home is 102 m² and is build in 2006. No pets allowed. The holiday home has washing machine. Tumble dryer. Freezer with a capacity of 45 litres. Further more there is 1 wood-burning stove. For the youngest ones there are 3 high chairs. The holiday home is situated on a 1390 m² natural site. Situated 450 m from the sea. Nearest shop is 950 m away. You will find a golf course in a distance of 4750 m. A 25 m² terrace belong to the holiday home. Furthermore the house has a 21 m² covered terrace. Swing. Barbecue at your disposal. Parking place by the holiday home.